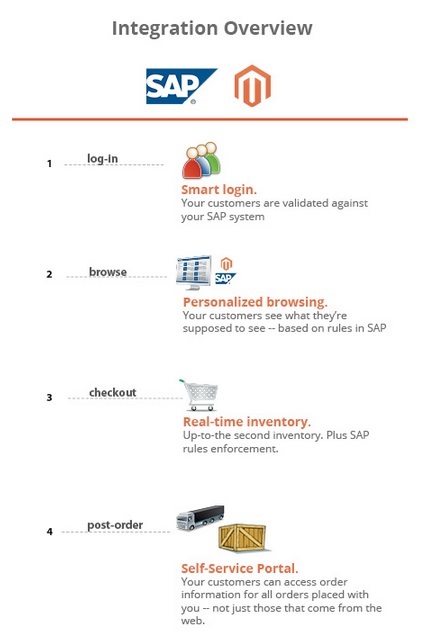 The following post is about SAP integration with Magento. Below, there are answers to the questions about what is SAP, what is ERP, and what should you do to connect the business software solutions to your Magento store. There are also a few examples of alternative ERP systems. SAP is a software company specialised at software for all possible industries and both big and small enterprises. Acronym stands for systems, applications and products (in data processing). Another important thing is SAP ERP. It is an enterprise resource planning system developed by the company. We should also mention Enterprise SOA – a service oriented architecture used in such SAP’s solutions as mySAP ERP, mySAP CRM, and mySAP SRM. A solution stack of company’s technology products is known as SAP NetWeaver. 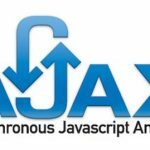 It consists of such building blocks as Portal, BI, Visual Composer, Auto-ID Infrastructure, Composite Application Framework, Development Infrastructure, Identity Management, Single Sign-On. Industry solutions include software for retail (ISR), public sector (IS PSCD), oil and gas industry (IS Oil&Gas), telecommunications (IST), healthcare (ISH), banking (an appropriate SAP), insurance (SAP for Insurance). There are also financial (FSN) and shipping (SSN) service networks and solution for engineering construction (EC&O), etc. You can discover all of them here. With industry-specific software, you are able to leverage the best practices and vast experience of SAP. All the processes and benchmarks are preconfigured for the certain industry. Thus, the software provides only useful features. The necessary functionality is available anywhere and anytime. The dedicated software for small enterprises and midsize companies consists of SAP Business One and SAP Business ByDesign. The basic idea beyond SAP is to provide users with the ability to work with a corporate database accessible from a range of business apps. All the applications are built around R/3 and newer systems. They aim to provide users with better management features. Finances, assets, cost accounting, personnel, production operations and materials, plants, documents and other possible aspects of modern business are covered by SAP applications. With the appearance of mySAP.com Web interface, the company added business applications for management of customer relationship, supply chain, etc. 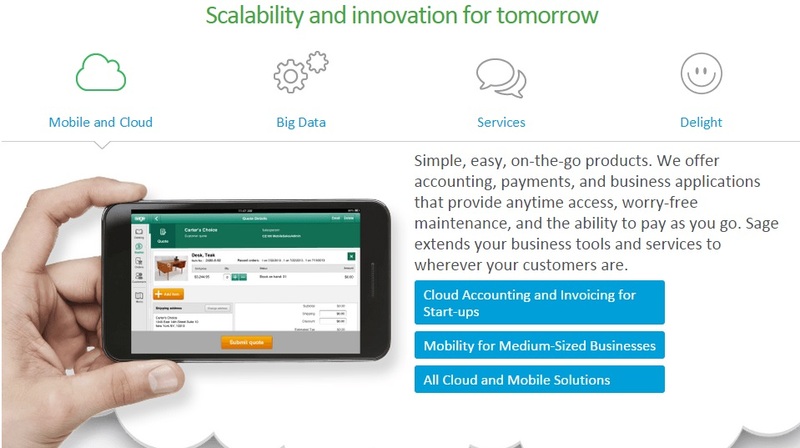 There are also dedicated mobile business applications, provided by SAP. It is also necessary to tell a few more words about enterprise resource planning systems. ERP is usually a set of business management software that provides employees with the ability to work with data in an easy way. It is possible to collect, store, manage and interpret information or perform any other actions, typical for different business activities, such as planning stocks and volume of production, managing sales and inventory, shipping and delivery of services, payments, marketing, etc. By using ERP system, you get an integrated view of major business processes of your enterprise. This often happens in real-time with the help of databases and appropriate management systems. All received data can be separated into 2 independent groups: business resources; and the status of commitments. For instance, raw materials, cash, and production capacity are from the first group, while purchase orders or payroll are from the second. All the information is shared between company’s departments. Thus, enterprise resource planning systems simplify the information flow between different elements of the complicated business machine, integrate different organizational systems, and provide error-free production. For more detailed information, hit this link. It is hard to imagine most modern businesses without e-commerce integration. No wonder there is a dedicated class-leading SAP ERP system for enterprises, that operate online. This software is able to streamline all parts of the retail chain. SAP ERP for e-commerce covers everything from purchasing to customer relations. In order to achieve better control over the enterprise, you get the access to all critical data. With feature-rich tools and top-notch data analytics applications, you will drive your e-commerce business forwards, getting the competitive edge over other market players. Fortunately, offline businesses don’t have to build their online presence from scratch. Of course, this sphere of activity can be absolutely new to them, and they will face a lot of challenges onward successful existence in the Internet, but there are a few core benefits over companies, that operate only on the web. These benefits should be used as a base for the integration into e-commerce. First of all it is a huge experience. The second benefit is business connections. The third one is the existing audience of customers. All these aspects can be tightly connected within a SAP system, which can be easily integrated with the Magento website. As a result, both online and offline components of your business will be linked directly. Keep in mind, that the gap between online channel and physical store often creates lots of problems, but there is a cure from this disease. It is a real-time sharing of information between all departments of the company. Warehouse, store and website are tightly connected. Stock levels are updated in real time. You always know, when it is time to re-order, and your online customers can see the current availability of goods. As a result, you can easily optimize stock levels. You get a database of your online customers. The availability of this information in SAP ERP systems streamlines ordering and shipping processes. Appropriate areas of the supply chain get all the necessary information in time. At the same time, customers should enter their details only once. In addition, they get the ability to track their purchases. SAP ERP integration optimizes the work of your administrators. They get all the data in one central point with real-time automated processes. SAP ERP also eliminates the need to upgrade the store manually. As a result, admin time is minimised. As you can see, SAP ERP integration with e-commerce store is very useful. Of course, you can still work without this system, especially if your enterprise is small, but there is a good reason to choose the opposite way. Being a totally scalable solution, SAP ERP can grow with your business. The good reason to integrate your Magento store with the platform is a learning curve. In a case of small enterprise, it is much more convenient to understand all the nuances of the system. In addition, you will be able to cut costs and enhance the productivity and efficiency of your business. The Magento platform is the best solution for every e-commerce business. It suits for both small enterprises and large international companies. The platform easily turns into a customer-facing part of every business. that’s why it is the preferred choice of retailers all over the world. High level of flexibility and control, overall functionality, outstanding performance, intuitive interface, and SEO-friendly design make Magento number one among other e-commerce platforms. Try not to think about Magento/ERP integration is a technical process only, because it is far away from it. The understanding of the organisation and its functional, political and cultural features is as much important as the technical nuances. the requirements of your e-commerce store. 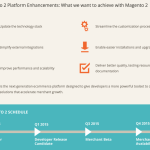 Keep in mind, that here are a lot of nuances concerned with Magento/ERP integration. For example, Magento provides a specific order workflow and a unique product data setup. And you should understand, how to connect your digital store to the enterprise resource planning system. How the product data is organized in Magento? What product types and attributes are required by ERP platform? How to transfer custom statuses / states to ERP? What is the influence of POS integration on enterprise resource planning system? To find the answers to all these questions you should find out the version of your Magento; get all the information about product types used at your store; learn all the nuances about attributes and attribute sets; study everything about orders, credit memos, and shipping; investigate the caching system of your e-commerce website. the aspects of your ERP platform. There are a lot of different enterprise resource planning systems nowadays, and SAP is the most popular one. Below we will provide a brief overview of the most reliable solutions, but all of them require a deep understanding. The more you know about both your Magento e-commerce store and your enterprise resource planning system, the easier will be their integration. As a store owner, you should understand specific needs of your business to get the maximum from both Magento and ERP . the data flow between Magento and ERP. Depending on the situation, e-commerce store and enterprise resource planning system may require one or two way integration. The information can go in both directions between two systems or it can be a unidirectional motion. The data flow could have different periodicity. Different types of data can be required in different parts of each system. And these are just a few examples of what you should understand thinking about Magento/ERP integration. 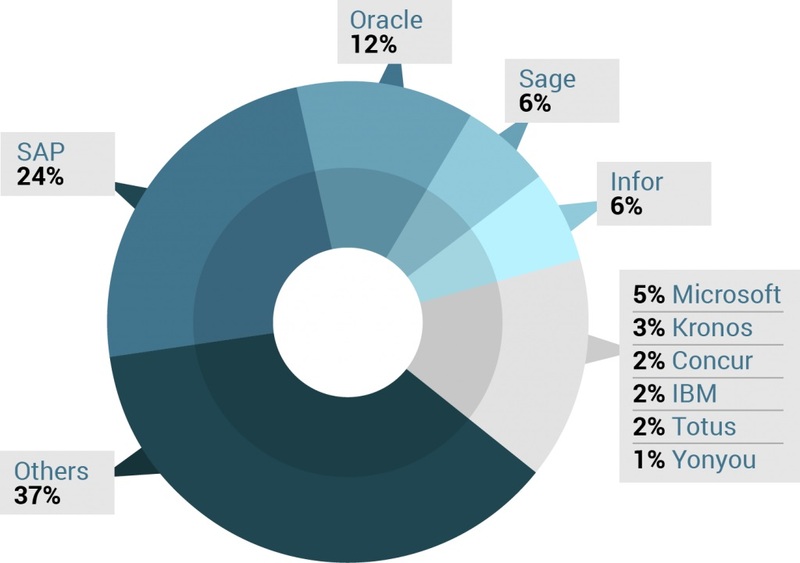 As you can see, SAP holds the leading positions among all ERP providers. Company’s ERP provides dozens of useful features, which are especially important for big businesses. SAP ERP supports such aspects as multiple locations, international operations, enhances analytics, etc. The standalone ERP solution by SAP is constantly updated. Moreover, there is a whole suite of business products, which you can add to the main platform. This provides an extra flexibility and advanced level of customization. And there are dedicated Magento extensions, developed to connect your e-commerce store with SAP ERP. Keep in mind, that they are not the same, so you should choose the one that suits the needs of your business. It is also necessary to understand, that after installing the module, you should perform a lot of configurations, because both Magento and SAP ERP are complex systems. Luckily, there is a SAP Integration and Certification Center. Additionally, you can rely on one of Magento companies specialized in integration with SAP ERP (InSync, eBridge Connections, Speed 4 Trade, Netresearch). 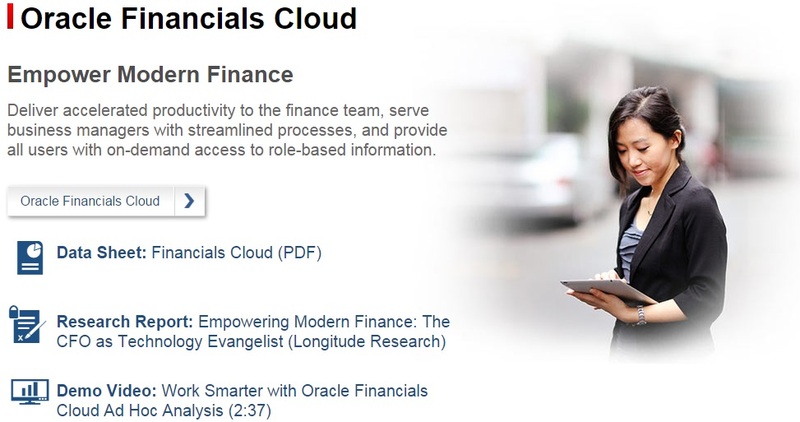 Oracle is the second market player behind SAP. The company provides a robust solution, that can be customised with the help of additional products. That’s why, Oracle ERP is also flexible as its SAP counterpart, but the company makes a strong emphasis on manufacturing industry. Thus, this ERP system first of all fits for B2B companies. Unfortunately, there is a lack of integration extensions. It seems that PunchOut2Go is the only solution. But even it doesn’t provide the full integration. So you should rely on developers. Unlike previous solutions, Sage provides its customers with wide possibilities integration with Magento platform. There are dozens of integrators on Magento Connect, which is far more than other companies provide. Since SAP is the most popular solution, below you will find the best integrators for company’s ERP and Magento. This Magento extension provides integration with just three versions of SAP – SAP ERP R3, SAP all in one, and SAP ByDesign. Magento 4 SAP supports bi-directional data transfer between two platforms. Thanks to delta-load functionality, it also provides the improved performance. In a case of problem, you can always rely on errors and alerts handling. In addition, you get the ability to integrate your e-commerce Magento store with other systems. 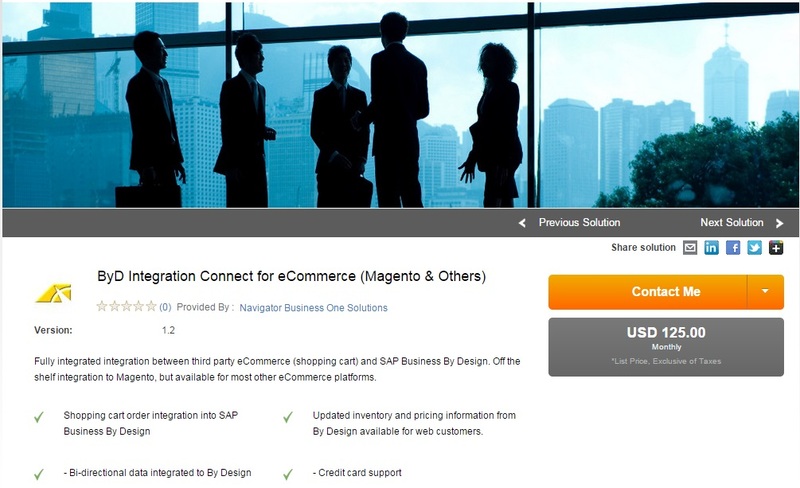 The Magento 4 SAP extension for the integration with SAP ByDesign costs €6,000. Two other solutions are more expensive. Hit the below link for the additional information. The ERP Integration Magento extension by aheadWorks aims to integrate your e-commerce store with almost any ERP platform. How seamless is this process, we don’t know, but it leads to the synchronization of key data between two platforms. Orders from Magento are imported into ERP system. At the same time, all updates of product information are transferred from ERP to Magento store. ERP Integration is able to work with large volumes of data – up to thousands of stock updates and orders per day. This business software solution costs $4,200. APPSeCONNECT is another tool developed for integration with different ERP and CRM systems. This module costs $6,000, but there is no any additional information on its Magento Commerce page. The popularity score of APPSeCONNECT is 321, the rating is 5/5. According to the reviews, this extension improves the efficiency of e-commerce business and helps avoid lots of integrational problems. Corevist provides two way integration between two platforms for B2B companies. Company’s approach is design independent. As a result, you can customize the look and feel of your Magento store as you wish. With Corevist, you will get a real-time inventory, integration of discounts and special prices into both platforms, integration of online payment solution with SAP, and many other features. Keep in mind, that the company provide one of the best cloud technology solutions. Hit the below link for the additional information. This is the official solution by SAP developed for Business By Design integration with different e-commerce platforms. Of course, it also works with Magento. It supports data flow in both directions. Your web customers always get the recent information and real-time updates about inventory and pricing. In addition, ByD Integration Connect supports information about shopping cart orders and credit card payments. The price starts at $125 per month. You can find more information below. This solution allows you to connect your e-commerce store and CRM app with SAP Business One. SAP Business One supports 10 platforms, both Magento Community and Magento Enterprise are on the list. You can also get a free trial. Hit the below link for all supported features. This add-on is designed for SAP Business One integration with Magento. It provides seamless data flow between Magento and the business software solution. 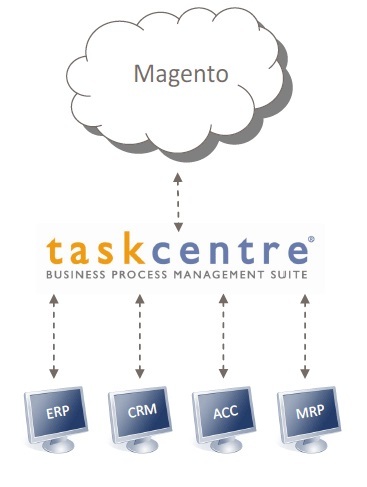 TaskCentre is also able to work with orders. It takes them from a dedicated business software and places within appropriate system responsible for courier services. In addition, TaskCentre provides automation of printing labels, extracting data from the different relevant sources and pushing it into Magento. This Magento module provides your SAP ERP with the ability to get order information from e-commerce store in real time. As a result, all orders made by your online customers are immediately created in SAP. The module works with all Magento versions. It also supports R3, ECC, and All-in-One business solutions by SAP. Standard pricing starts at $2,500 per month.